If you've installed Beaver Builder and can't see any sign of it on a page you open, try these troubleshooting steps. You can't edit a page or post in Beaver Builder because you don't see the tab? From the WordPress admin panel, go to Settings > Beaver Builder > Post Types and make sure the correct checkbox is selected for the page or post type you want to edit. Make sure Beaver Builder is enabled for the correct user roles. 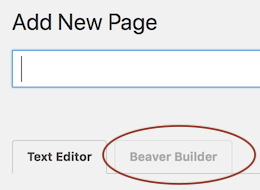 From the WordPress admin panel, go to Settings > Beaver Builder > User access. In the Builder access field in the Front end section, make sure the user role is enabled for the user having the problem. Normally when you open a page for editing in Beaver Builder, you see the Beaver Builder admin bar across the top of the page, as in this screenshot. The other likely cause is a conflict with another plugin installed on your site. Follow the Related Link to troubleshoot plugin conflicts.